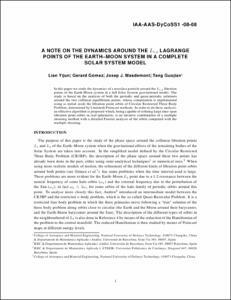 Tang, Guojian; Gomez Muntané, Gerard; Masdemont, J.J.; Yijun, L.
The purpose of this paper is the study of the phase space around the collinear libration points L1 and L2 of the Earth–Moon system when the gravitational effects of the remaining bodies of the Solar System are taken into account. In the simplified model defined by the Circular Restricted Three Body Problem (CR3BP), the description of the phase space around these two points has already been done in the past, either using semi-analytical techniques1 or numerical ones.2 When using more realistic models of motion, the refinement of the different kinds of libration point orbits around both points (see G´omez et al.3) has some problems when the time interval used is large. These problems are more evident for the Earth–Moon L2 point due to a 1:2 resonance between the natural frequency of some halo orbits (!h) and the external frequency due to the perturbation of the Sun (!s); in fact !h ' 2!s for some orbits of the halo family of periodic orbits around this point. To analyse more closely this fact, Andreu4 introduced an intermediate model between the CR3BP and the restricted n-body problem, which is the so called Quasi-Bicircular Problem. It is a restricted four body problem in which the three primaries move following a “true” solution of the three body problem along orbits close to circular (the Earth and the Moon around their barycenter, and the Earth-Moon barycenter around the Sun). The description of the different types of orbits in the neighbourhood of L2 is also done in Reference 4 by means of the reduction of the Hamiltonian of the problem to the central manifold. The reduced Hamiltonian is then studied by means of Poincar´e maps at different energy levels. Tang, Guojian [et al.]. A note on the dynamics around the L1,2 Lagrange points of the Earth-Moon system in a complete solar system model. A: IAA Conference on Dynamics and Control of Space Systems. "Final papers". Porto: 2012, p. 1-19.